Lee College Pres. Dr. Dennis Brown offers congratulations to the Goose Creek Consolidated Independent District at the Nov. 10, 2015, dedication ceremony for the new IMPACT Early College High School building. IMPACT students complete a rigorous program that gives them the opportunity to earn a high school diploma and two years of college credit simultaneously. BAYTOWN, TX – Lee College administrators and faculty joined the Goose Creek Consolidated Independent School District (GCCISD) this month for the dedication of the new building for IMPACT Early College High School, where students are able to earn a high school diploma and two years of college credit simultaneously. “We are true community partners: Goose Creek and Lee College have the same dream and vision,” Pres. 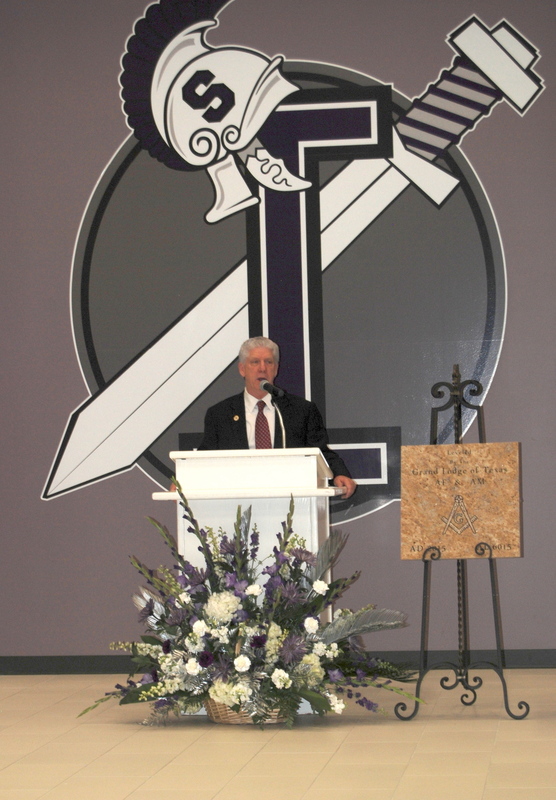 Dr. Dennis Brown said during the dedication ceremony, held Nov. 10 in the high school cafeteria. Operated by GCCISD, IMPACT first opened in 2010 in the Advanced Technology Center at Lee College and was also housed temporarily at the Peter E. Hyland Center. Now located on Market Street, the new building was ready by the start of the 2015-16 school year. The college campus is only a short walk away and easily accessible via a path constructed across Baytown’s Bicentennial Park. The first IMPACT graduates received their diplomas in 2014, with about half of the 89 members of the class also receiving one or more associate degrees. The Class of 2016 includes 92 students, of which 60 are expected to earn both a diploma and an associate degree in May. Lee College waives the students’ tuition and GCCISD provides their textbooks. When IMPACT Early College High School opened its doors on the Lee College campus, no one was sure exactly what to expect — not even the Goose Creek Consolidated Independent School District (GCCISD) eighth-graders who applied for admission, intrigued by the opportunity to earn a high-school diploma and two years of college credit simultaneously. Four years later, those first students are now IMPACT seniors preparing for graduation. In addition to their diplomas, about half of the 89 members of the class of 2014 will also receive associate’s degrees Saturday, May 10, at Lee College commencement in the Sports Arena. IMPACT principal Jacquelyn Narro certainly thinks so, noting the seniors are largely self-motivated and dedicated students who have proven their ability to accomplish lofty goals. Reaching this milestone with the first graduating class speaks to the student-centered commitment shared by Goose Creek and Lee College, she said. Moving forward, Narro plans to continue building enrollment at IMPACT and sharpen the focus on first-generation college students who might not otherwise have the means or opportunity to pursue a degree. Lee College waives the students’ tuition and GCCISD provides their textbooks. The daughter of immigrants and a first-generation college student herself, Sprecher will study biochemistry at Bryn Mawr College on a full-tuition scholarship from the Posse Foundation, one of the most renowned college access and youth leadership development programs in the country. Though excited to begin her next chapter in Pennsylvania, Sprecher said it won’t be easy to leave behind the teachers and administrators who pushed her to discover her talents — or the IMPACT classmates who became more like brothers and sisters as they encouraged each other through the rigors of balancing both high school and collegiate coursework.